-I’ve huddled in a bathtub in Mississippi as a tornado ripped through my street and neighborhood, leveling homes and businesses and throwing a school bus on top of an elementary school (our house was untouched!). The sound was one of the loudest and scariest things I’ve ever heard. -I left Tokyo less than 2 days before the massive earthquake and tsunami of 2011 and the place I had been staying (with my kids) was evacuated due to the nuclear meltdown. I had been feeling the foreshocks but thought they were regular earthquakes. -My first trip ever to Manhattan happened to be scheduled a week and a half after 9-11. I went on the trip anyway and ended up feeling like the only “tourist” in the whole city. Half of the roads were still shut down and there was dust and rubble all over south Manhattan. It was eerie. -I’ve holed up in Okinawa, Japan in our sturdy reinforced concrete home through several enormous typhoons, including a category 5 that caused a lot of damage. -I’ve been through significant earthquakes in Alaska, scary hailstorms in Oklahoma, and hurricanes in Florida. So, I’m a touch paranoid about them. I definitely felt a little uneasy about traveling to a tiny country with 37 volcanoes. Thankfully, no major eruptions happened during our trip, and we had an amazing time. Climbing Guatemala’s Pacaya Volcano was one of the absolute highlights of our trip. 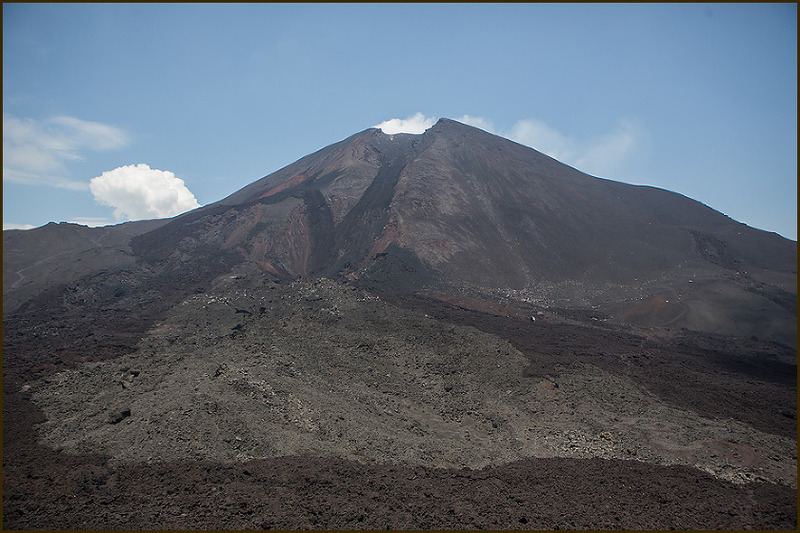 Pacaya is an active volcano about an hour away from the colonial city of Antigua. It is extremely active, nearly continuously spewing ash and smoke. Several large eruptions over the past few decades have sent slow moving rivers of lava down it’s slopes. One especially large one in 2014 blew the top of the cone right off the peak, leaving a collapsed crater. Most people make the hike either in the morning or the afternoon for sunset. We chose morning primarily because we have young children and they have the most energy in the morning. Also, we didn’t like the thought of navigating back down the mountain in the dark. It turns out we made a fortunate choice, because we had beautiful clear weather for the entire hike up, and low foggy clouds rolled in just as we were leaving, obscuring the views. Our driver JB picked us up and we stopped for an amazing breakfast that included Guatemalan hot chocolate. He then negotiated the price for 3 horses and a guide for the hike up. 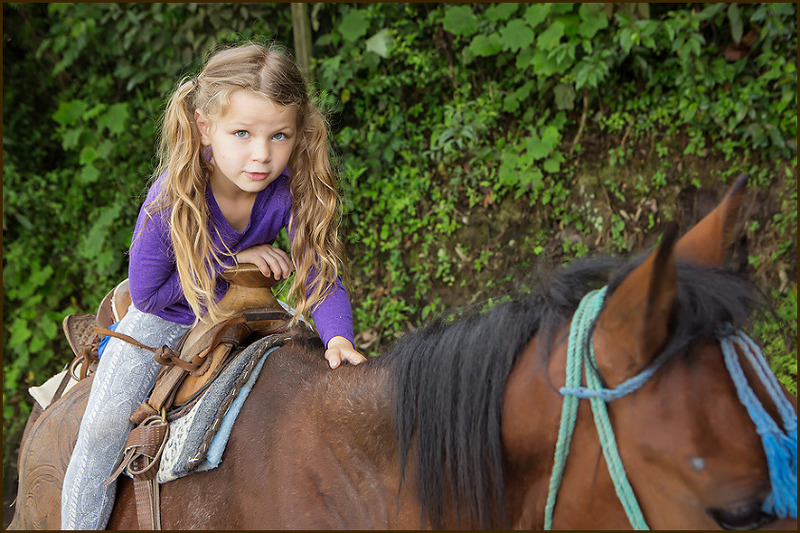 The girls each rode their own, and Flynn rode in my lap on a horse named Chocolate, while Jason trekked up on foot. The lower part of the hike was very tropical and lush, with several stops for historical points of interest. It wasn’t too long before we emerged from the jungle and came upon a ridge of volcanic rock. There we had a clear view of Pacaya’s peak. Tourists used to be able to hike all the way to the top before the eruption in 2014. Now it’s too dangerous. 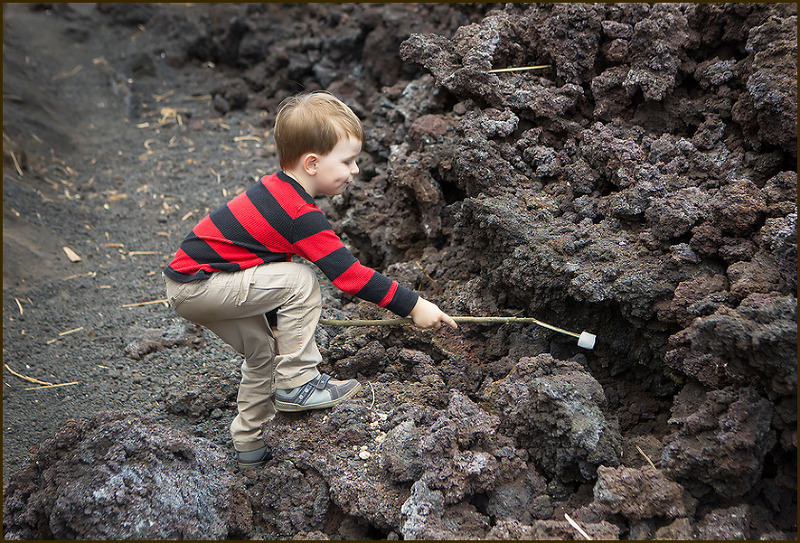 We left the horses and hiked down the alien, barren rock field until we reached a tiny hut, the Lava Store. Here a couple of friendly volunteers sell handmade lava jewelry crafted by some of the villagers who were effected most by the recent lava flows. The kids were enchanted with the resident volcano dogs, particularly a small well fed black dog named Taco, who loves belly scratches. We had one more ridge to climb before it was time to head down with our horses. Flynn was starting to get tired, so our wonderful guide Fausto gave him a piggy back ride up the final part of the hike. The view was incredible, and one of the sweet dogs from the lava shop followed us and kept us company. The ride down was much faster, and we left for Antigua tired and happy from our amazing day. LisaLDN - That is so cool! I had no idea you could do that! Your pictures are great too, what camera do you use? Conor - Argh your kids are so lucky to have such awesome parents!